My goal is to write at least 5,000 words a day and return to civilization with two short stories and the start of something new. I have written as much as 8,000 words in a day before (once and only once). I’m hoping to achieve those heady heights again or even 10,000-word days. Seven days alone on a small island with nothing to do, it should be easy, right? Except that now that I’m on the island, I can’t get settled. There’s so much to explore, without even leaving the living area. I am meeting interesting people (birdwatchers, all) and trying to make sense of the instructions on the (two shared) toilets. It’s much more civilized than I expected and yet completely foreign. There’s my room: two twin beds and a sink with running water and plenty of shelves to store my things. 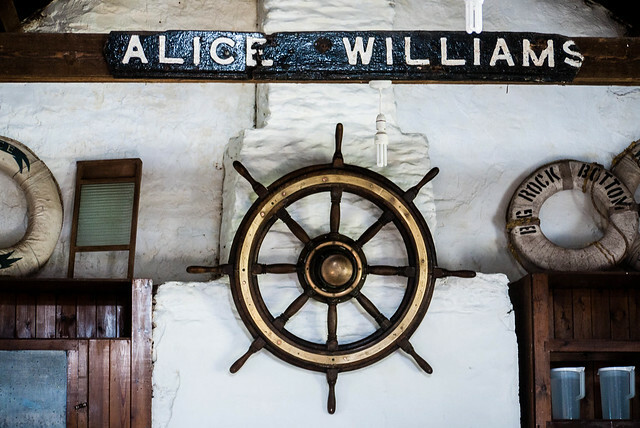 There’s the wheelhouse, so named because it has the wheel of the shipwrecked Alice Williams (along with the figurehead and plenty of thick beams of old wood). The wheelhouse is split into two by a low doorway (at 5 foot nothing, I’m the only one who doesn’t have to duck), with a long dining table and a very nicely kitted out kitchen. There’s a large solar-powered refrigerator and a mouse-proof pantry to store my food. There’s an office, occupied by two volunteers who are transcribing the hand-written logs from the previous wardens of the island, going back to the 1930s. What there isn’t, is a quiet room with a desk where I can sit undisturbed and write all day long. I have no idea what I expected. An office with my name on the door that no one else is allowed to use? But it’s fine, I’ll make do. I park myself in the dining room, at the far end of the table away from the kitchen. People come and go all afternoon long. Bird watchers are a social group. They are all lovely but it’s an endless stream of chatter and by the time the last person has had lunch, the first ones are returning for dinner. 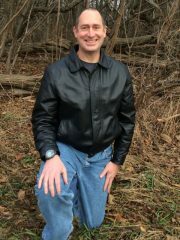 I have written a few hundred words and given my life history to three people. This is not going to work. I’ve never been any good at writing in my lap and I don’t really want to try to write at speed in my notebook with pen, which I brought for emergencies. The island is full of surfaces that are just too high or just too low or too thin, like I’m trapped in some sort of Goldilocks writer’s hell. Instead, I join the others for a tour of the island. Skokholm, Richard tells us, is a honeycomb of burrows. 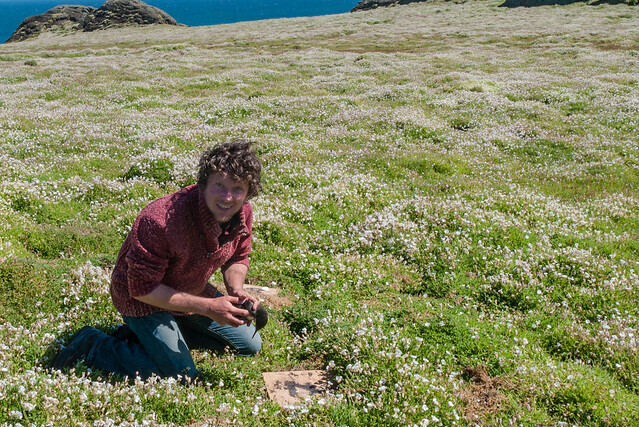 The rabbits, the puffins, the storm petrels and the manx shearwaters all make their own burrows and to be honest, it’s a bit of a nightmare, the island riddled with holes. The manx shearwaters only come out on dark nights to feed; they are too vulnerable in the day. Richard counts them to tally up the numbers, keeping a close eye on their fight for survival against the gulls. Last year, he painted them blue so he would know the corpses already counted. This year he’s come up with the bright idea of cutting off their wingtips instead of the bright blue paint. I look at the dead birds with their wings clipped, splayed on the dirt path like fallen angels. The greater black back gulls are his favorite, he tells us, the apex predator of the island. But I saw the way he held a manx shearwater when checking its ring and it sure looked like love to me. He takes us to the lighthouse at the far end of the island, built in 1861 (although there’s been a lighthouse on the spot since 1776) and automated in 1983. This is where Richard and Giselle live. There’s no running water and they are in the process of renovating it, bringing a new dimension to DIY. He invites us in to climb to the very top, where you can see for miles. Grassholm shimmers white in the distance. 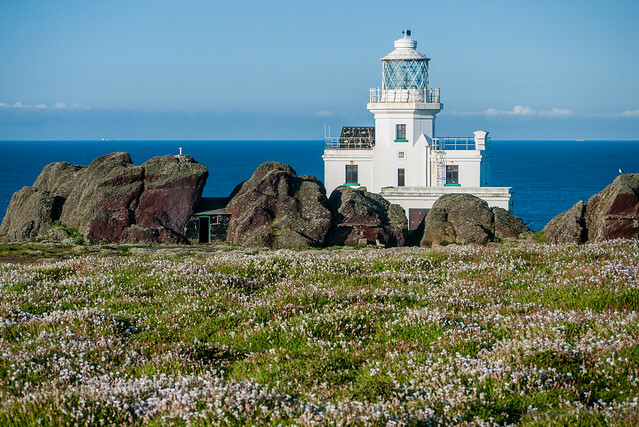 Beyond that, Smalls Lighthouse is perched on a cluster of rocks: the most remote lighthouse operated by Trinity House. He tells us the true horror of the lighthouse keeper gone crazy on Smalls and I am thrilled, the island has already given me a story to be told. Down below, we can see hundreds of square stone tiles scattered in the grass around the lighthouse, each with a number painted on. 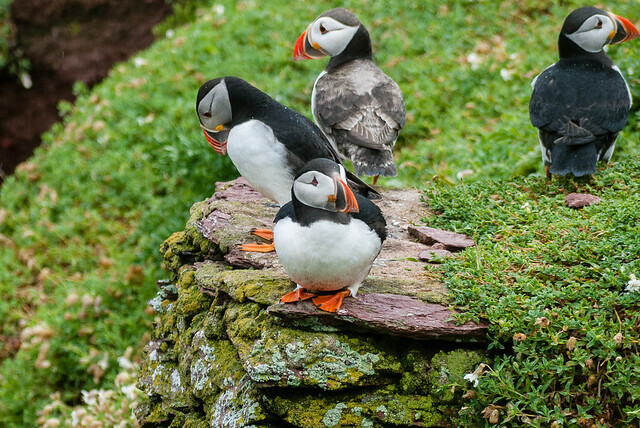 They are top entrances to the manx shearwater burrows. The wardens use them to open the burrow and check the residents, an extremely personal parenthood poll. Too soon, we leave to walk back to the cottage and farm buildings but I make a mental note to ask Richard if I might come back again and photograph his lighthouse and the burrows. Everything about the island is amazing. The first day of the writing retreat, I walk over five miles and I take 224 photographs. I only manage to write 647 words of notes and brainstorms, not counting excited squeeing about the island. But it is only the first day, a travel day. I didn’t expect to have much time to write. I promise myself that I will do better tomorrow. It sounds like a magical place. And of course you can’t do much writing on a travel day. I wonder what tomorrow’s going to be like?